Oran Kearney receives the award. Coleraine FC boss Oran Kearney has been named BetMcLean Manager of the Month by the NIFWA. The Bannsiders won their first four league games of the season and booked their place in the next round of the BetMcLean League Cup with a win over Larne. 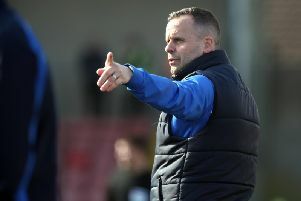 Reflecting on league wins over Dungannon Swifts, Cliftonville, Crusaders and Warrenpoint Town, Kearney said, “It’s been a fantastic start to the season and I’m delighted for our players. “It’s a great honour to win this award but I don’t see it as a personal award, I am just representing the club that won the award. Ultimately, it’s the boys that went onto the pitch and won those four league games.